If you’re looking for a natural remedy to cure a cough or cold or for the calming effects of nicotine without the nicotine, say some proponents of the Lobelia plant, look no further. Lobelia, also known as Indian Tobacco, is a common plant that works as both a stimulant for the respiratory system as well as a general relaxant. In fact, it provides the same relaxing feeling you get from a puff of a real cigarette, without the negative effects of lung cancer and other respiratory ailments. The magic ingredient in Lobelia is s called lobeline, and while chemically it is similar to nicotine, it is non-addictive and has the added effect that it can help calm and support the respiratory tract. Historically it has been used as an overall tonic for lung problems, and is also now used by some proponents as a powerful weapon to fight nicotine addiction. It sounds too good to be true. So is it? Has traditionally been used to treat lung-related ailments such as asthma, bronchitis, pneumonia, emphysema, cough, colds, flu etc. Lobelia has been touted since the 1930s as a nicotine withdrawal aid. It purportedly works by tricking the body into thinking it has absorbed nicotine, as lobeline mimics the same feelings the body’s receptors feel when nicotine is in place. Lobeline is still the main ingredient in many chewing gums prescribed by doctors as non-smoking aids, and research is underway to see if lobelia can also help methamphetamine addictions. The problem, however, is that while it indeed is non-addictive and has some positive effects, researchers say that the negative effects far outweigh them. To add insult to injury, a big study in 1973 said lobelia had no positive effects on smokers whatsoever. Furthermore, according to the U.S. Mayo Clinic, other studies have proven that lobelia can be toxic, causing dangerously low blood pressure, vomiting, diarrhoea and even seizures. No wonder it has also been dubbed “pukeweed” and “vomitweed”. 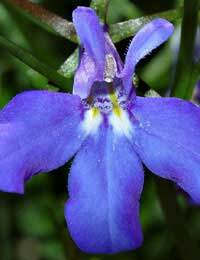 Lobelia is available as a liquid extract, capsule or in dried herbal form to make tinctures and teas. Some people think lobelia is a wonder herb, others believe it is pure poison. Many people believe that with the proper care and caution, taken only in the recommended dose and avoid entirely by people who should not be taking it (such as pregnant and breast-feeding women), that lobelia is safe. Others disagree, saying that the jury on its efficacy is not out, and that it seems to be doing more harm than good. If you are interested in trying lobelia – or indeed, any herb or herbal supplement – discuss the pros and cons first with your GP. As always, never take any type of supplement or herb without consulting with your GP first, even if it appears to be 100 percent natural. And as there are no studies on whether lobelia in any form is safe for children, avoid giving it to them under any circumstances. How Can Immune Building Supplements Help my Breathing? Can Echinacea Improve my Respiratory Problems? How Can Zinc Soothe Breathing? Can Flax Seeds help Alleviate Coughs?